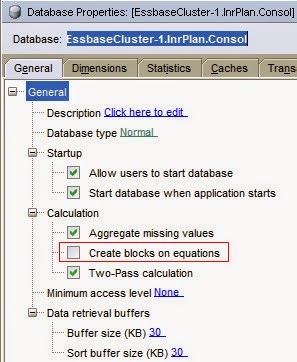 Block creation is always an issue for Planning or Essbase projects, you need to consider whether the block is existing in the business rules or calculation scripts. That's because the setting of the following option is set to off by default. Here is an example for the function @CREATEBLOCK. Note that at the left hand side of the equal sign, it should be a sparse dimension member.